If you followed me along on Instagram last week, then you saw I was at the photoshoot for my third cookbook, coming out in spring 2018! I haven’t shared many details about the book yet, so stay tuned, but I couldn’t be more excited about it, especially after the photoshoot. At these photoshoots, your recipes come alive, thanks to the talented team behind the shoot, like the photographer, food stylists, prop stylists, and all the assistants. The tentative title of the book is “Inspiralized & Beyond” (and I’m rooting for that to be the actual title), because not only will there be spiralized recipes (of course) in the book, but there will be other creative ways to turn vegetables into healthier versions of your favorite meals. I’m bringing out new tricks! And as you already know, I love using GreenGiant’s Riced Veggies as rice alternatives – it’s quick, easy, and doesn’t require a big mess. 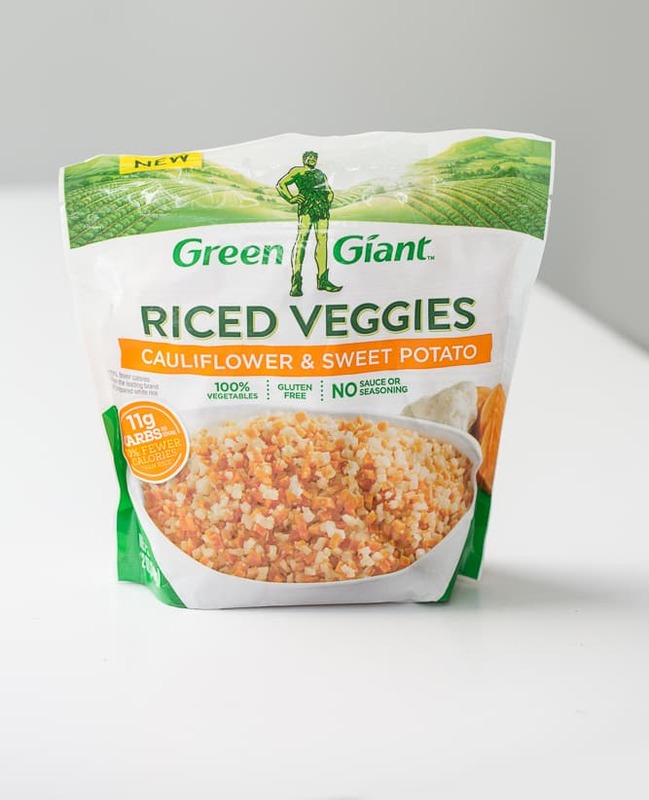 My biggest gripe with making riced cauliflower is that it’s time consuming and messy, which is why I love GreenGiant – and they make fun varieties, like the one used in today’s recipe, combining riced sweet potato and cauliflower. 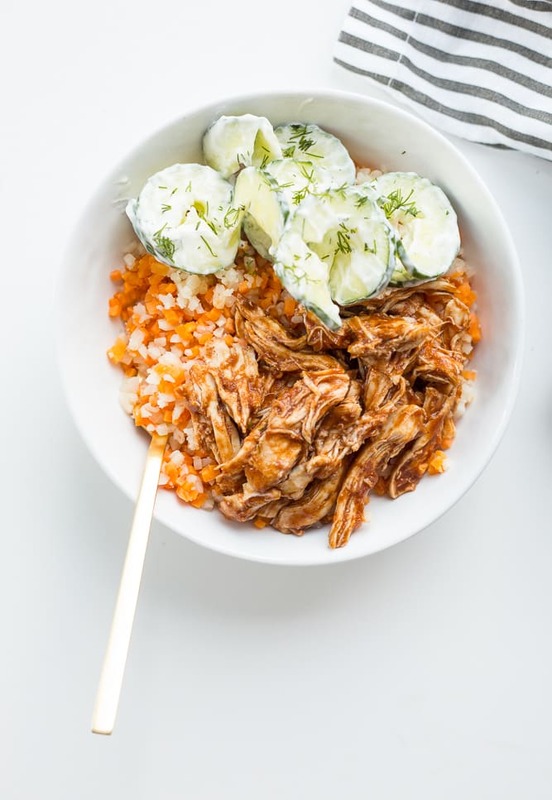 The riced veggies are sauteed in a simple olive oil and garlic and then topped with BBQ shredded chicken and cucumber noodles that are slathered in a yogurt sauce. 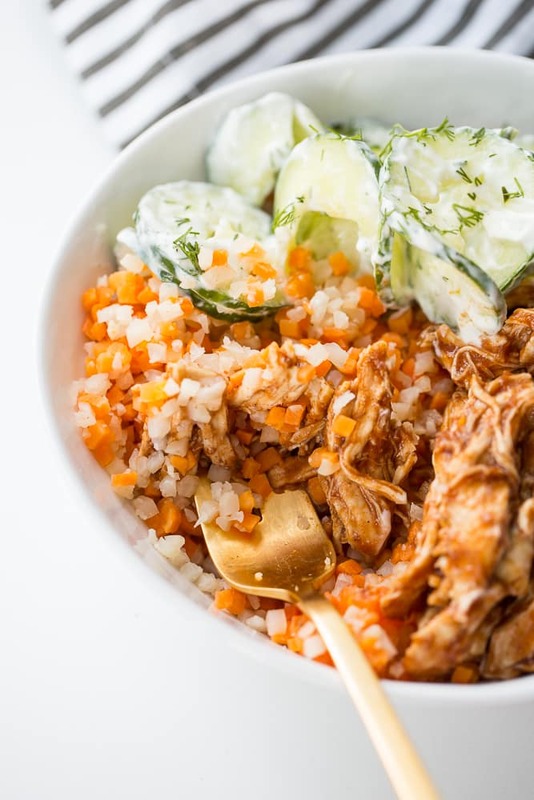 It’s a quick and easy 30 minute meal that can be mostly meal prepped! Note: This post was sponsored by GreenGiant. However, all opinions are my own, always. Heat the oil in a large skillet over medium-high heat. Once oil is shimmering, add the garlic, red pepper flakes, and cook for 30 seconds or until fragrant. Add the GreenGiant riced veggies, and stir well to combine. Let cook until heated through, about 5 minutes. Meanwhile, bring the barbecue sauce to a moderate simmer in a medium pot over medium-high heat. Once simmering, add the chicken and stir well to coat. Let the chicken heat up for about 5 minutes. 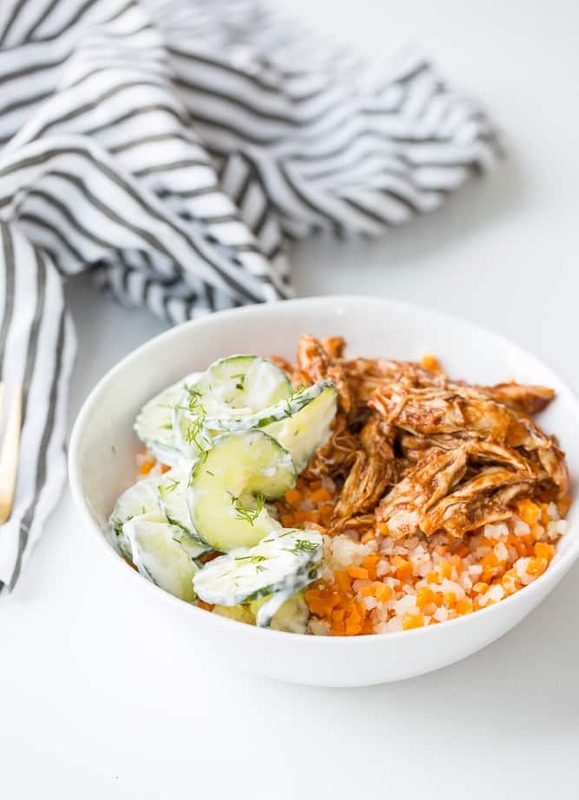 While rice and chicken cook, prepare the cucumber salad. In the bottom of a medium bowl, add in the Greek yogurt, lemon juice, dill, and season with salt and pepper. Stir well and add in the cucumber. Toss well to combine. Set aside. Divide the GreenGiant rice into bowls. Top with BBQ chicken and the salad. Serve. Just use any variety of GreenGiant's riced veggies you'd like! For this one, I used Riced Broccoli & Cauliflower in the video and Sweet Potato & Cauliflower in the blog recipe, to show variety. Just go with your preferences! Hi Ali This sounds Amazing!!!! I purchased your green Inspiralizer and sent my sister my other unit with all the separate blades, which did work great, but was a hassle with all those blades and cleaning. I Love my pretty green Inspiralizer. I have Wolfgang's chopper and it is a breeze to rice cauliflower etc and so much cheaper so unless I'm in a pinch I do that. Also when on sale I buy up several heads of cauliflower and rice and vacuum seal it and same with Zuchinni etc and really saves. And Yes I do keep a few of your suggestions oh hand for a quick variety so thanks honey and keep up the great work. Cannot wait for the new book as love the first two. To Kathleen...when you refer to "Wolfgang's chopper" (with which it's a breeze to rice cauliflower), what chopper in particular are you talking about? We cook for Seniors at a Senior Activity Center and I am wanting to offer meals that are low in carbohydrates. I want some "easy" way to rice cauliflower. Hi Ali. To the last lady who asked about the chopper it's the 50 oz compact processer he sells on HSN and I've had mine at least 4 years or longer and it works like a top for any and everything. I break up the cauliflower in florets and give a few pulses and voilà!!!! I make all my own salad dressings in it, I've cut up lbs and lbs of chicken breasts and thighs and ground and made up burgers of all flavors etc just to tell you the power and it works same as day I bought! AND no Do Not get a dime to mention this product, I just happen to love it in conjunction with my Inspiriizer! Love the beet recipe Ali!!!!! Hi ali! I just made this a few minutes ago and to confirm - you aren't supposed to cook the rice first right? Also, when u put it in myfitnesspal I got 301 calories if you do it as 2 servings as the rice alone is 100 per serving and the chicken is 100. Are Green Giant Riced Veggies GMO free?